Ask fellow campers about "Roughrider Campground" and nearby attractions. Really nice camp grounds me and my husband come up here 3 times a year. 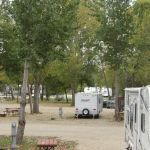 The camp grounds are well kept and the staff is friendly and extremely knowledgeable and are so nice! 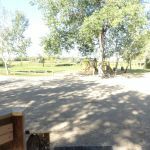 It's such a refreshing change to see such a well kept and gorgeous property I highly recommend this :) It's such a delight every time we come the park is delightful and peaceful in beautiful Minot. I highly recommend you check this park out next time you're passing though we spent 2 weeks there. It was lovely, we will definitely come back. We had such a fun time with the outdoor games my family loved it This is the list of some of The amenities OX Bow (Lake) Horseshoes Outdoor Games Playground River Nature Trails Sports Field wonderful, grassy expanses next to ponds for tent campers, and mowed trails wind through a forested area next to the resort. 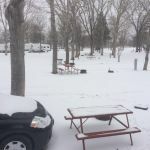 Excellent No Dust Roads Surface of Interior Roads Gravel Dump Station Fire Rings Laundry Newspaper Restrooms RV Storage Showers Table At Some Sites Tenting Overflow Area We camped at Roughrider Campground in a Fifth Wheel. Best wi-fi of any campground we've been. Gravel roads and site. Site was level with full hookups, fire ring and picnic table. Convenient clean laundry (6 washers & dryers), $2.25 wash. Large number of channels over-the-air, good cell signal on T-Mobile. Shopping was 4-5 miles away. We would stay here again. We camped at Roughrider Campground in a Motorhome. Thank you very much for taking the time to review and comment on your stay at Roughrider. We look forward to seeing you again. This park could have been really nice if they had watered the grass and cleaned up the sights. Weeds, trash and generally unkept. We stayed 2 nights.. we did not use the showers so have no idea if they were clean. Sad. Could be really nice. Very good WiFi. We camped at Roughrider Campground in a Motorhome. Thank you for taking the time to rate and review your stay with us. We do apologize for your unhappiness with the campground. The staff tries to stay on top of the weed control and we make sweeps daily of the sites for trash, apparently we missed some. The state of North Dakota has been under drought conditions for the past 2 years and nothing grows green but the weeds so unfortunately we are pretty much stuck with the brown grass. Thank you very much for pointing out what was missed it will be addressed with the rest of the staff and what we can correct will be corrected. We hope you will stay with us again if you are back in the area and I believe your experience will be much improved. The best element of this campground is the access. It is easy to reach and interior roads are mostly wide enough for a 40' MH. We disconnected the toad. Otherwise the campground is dirt roads, undefined gravel campsites, only a playground for amenities. Residents include seasonal, permanent and transient. WiFi is very good, satellite or OTA tv is limited. Directions on google or the website do not include a mile marker to exit at; that mile marker is between 142-143. We camped at Roughrider Campground in a Motorhome. This is our second time here, convenient for visiting relatives. Park is about 1/2 mile off Route 2 west of Minot. Sites are a little tight, most are pull through, gravel and many oil workers (nice folks) staying here. All utilities worked fine, full hook ups, no cable, but over the air pulled in many channels clearly. WiFi is just OK, works, but challenging at times. Used our own hotspot most of the time. ATT service had 3 bars. Very nice laundry facility. 6 washers and 6 dryers, $2.25 wash, 25 cents per drying period. They have a very nice childrens playground in the front of the park, with swings, slides and basketball court. Trains.... yes, there is a main line track crossing about 1/4 of a mile away, so trains are blowing their horns approaching the crossing all the time. Not too bad though. Wal Mart, Target, food shopping and the Dakota Mall are all about 5 miles south along with all the usual chain restaurants. There is a huge RV dealer and parts house about 1/2 mile from the campground, nice and handy if you need any parts or repairs. We camped at Roughrider Campground in a Fifth Wheel. Easy to get in/out of park. Everything is gravel. Utilities worked fine. Wifi was iffy in spite of claims. Sites are packed tightly together. Lots of trees so many are no good for satellite reception. Trains blowing whistle all hours of the day and night. Ok for a stop but I wouldn't stay longer. We were here (not intentionally) during the fair so the place was packed tight as sardines. Possibly why the Wifi was not as good as advertised. We camped at Roughrider Campground in a Fifth Wheel. This is a nice campground with gravel sites. Check-in was quick and a very nice lady helped us. We had full hook-ups and a pull-through site. When we checked in the lady gave us a longer pull-through site so our motorhome and tow vehicle would fit better. We were very comfortable and would like to stay here again. 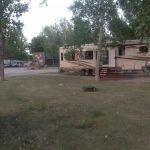 We camped at Roughrider Campground in a Motorhome. Needs TLC. Close to your neighbors. Really good wifi - strong and did not drop off! Lots of TDY workers. Staff very helpful. We camped at Roughrider Campground in a Motorhome. Dakota Air Museum very interesting. Campground was very nice, however had to pay additional $ for five minutes of shower time plus .25 cents for every 1 1/2 mins of additional shower time. Bathrooms were very clean. Laundry facilities very clean, however, seemed a little excessive for both wash and dry. Campground owners were very nice and helpful. Would stay again for overnight stay even though was $40.00 plus dollars with Good Sam discount. We camped at Roughrider Campground in a Motorhome. A lot of the sites are side-by-side quite close together. Other sites are not very spacious. Good FHU and good WiFi. We camped at Roughrider Campground in a Motorhome. Campsites are squeezed very tightly together. Okay for one night stay if you don't mind mere inches between you and your neighbor. Wouldn't use fire ring. Too close to RV for even small fire. Back side of table was inches from neighbor. We camped at Roughrider Campground in a Travel Trailer. We originally planned to stop for two nights as it was time for a rest day. We ended up staying for 10 days. We had gone to a local RV dealer to look for a surge protector as ours had died and bought a new RV. The campground was able to accommodate us for the extra week we had to stay and even helped us by loaning us boxes and allowing us to put our "stuff" on the site while we went to pick up the new one. They were wonderful. We had a site near the office and had excellent WIFI. 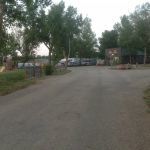 The campground was clean, the sites were mostly shaded, the roads were wide and the laundry room and bathrooms were spotless. The managers and their staff worked from early morning until late at night - cleaning the office, taking care of customers, and working on landscaping and improvements. They certainly take pride in their campground. Sites were side by side but they tried to leave spaces between rigs. We never had anyone next to us. The only negative I can think of is that if you are a tent camper the bathrooms are quite a distance from the tent area. There's a river and geese and it was just a pleasant place to stay while we waited for our new fifth wheel. We camped at Roughrider Campground in a Fifth Wheel. The park is close to HWY 2, interior roads are tight but adequate for a 45 footer. Power is good, there are a couple trees that got in the way of one of the satellites but were only here one night so we 'roughed' it and went with no HD TV for the night. :-) The staff is very friendly. Would stay here again. We camped at Roughrider Campground in a Motorhome. shopping was just a couple miles away. Perfect spot for a quick stop on the road. Very clean restrooms and pleasant host. We camped at Roughrider Campground in a Travel Trailer. Very nice campground just outside Minot. Very friendly check-in with offer to point out local attractions. Wide roads with ample space to park 45' plus tow. Mature trees but enough clear space for satellite to pick up signal. Wi-fi speed satisfactory. Some of the sites back up to a very peaceful river. We camped at Roughrider Campground in a Motorhome. Unfortunately we found ourselves in need of dental work while staying in Minot. If anyone should find themselves with similar needs, we highly recommend Minot Dental Partners. They were incredibly accommodating and very professional. We saw two major RV stores on the way in. Lots of support for your rig at least in this area, we suspect due to the oil field workers also using a lot of RVs. Ensure you know which exit route you are taking on leaving the park as some rigs have gotten in trouble using the entrance which is curved and sloped into the ditch. 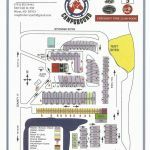 Are you affiliated with Roughrider Campground ?